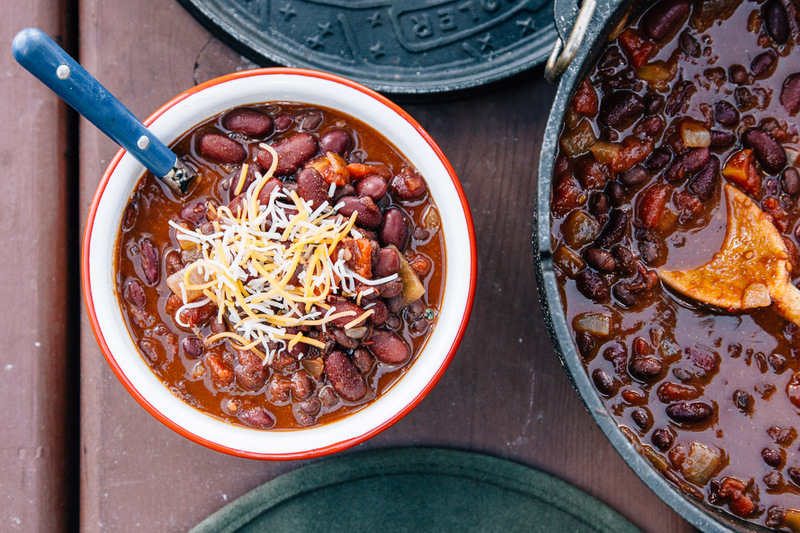 There’s nothing like gathering around a fire at night with a heaping bowl of chili in hand. Especially as the weather starts to cool, there’s something comforting about a meal that can bring the heat in more ways than one. 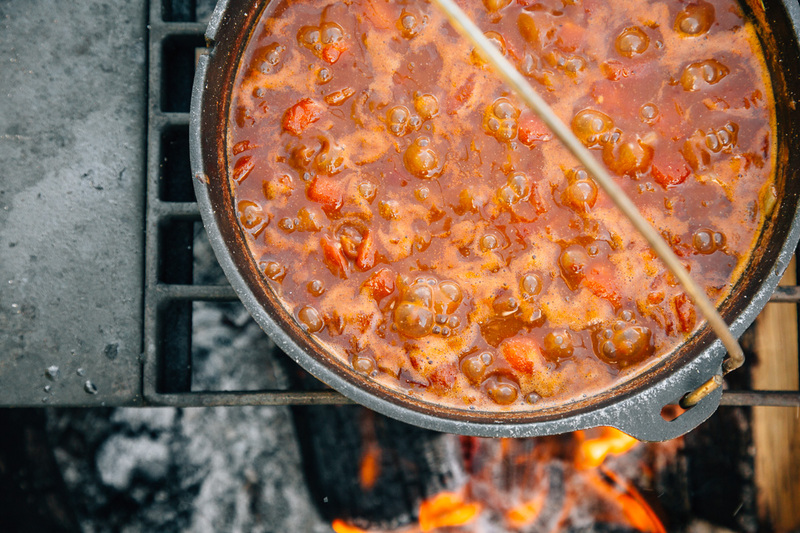 While this classic cowboy stew got its start in the American southwest, it has become a cornerstone of camp cooking all over. 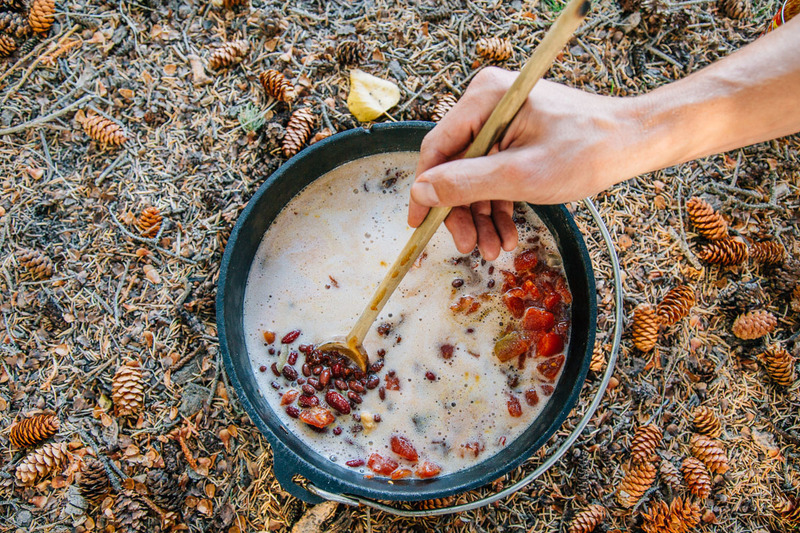 Visit any campground in the US and there’ll be at least one person cooking up a pot of chili. 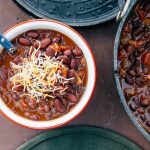 Now, there are a million and one ways to make chili; nearly every “chili enthusiast” has their own unique secret recipe. The truly devoted make their chili using only the freshest ingredients. The truly lazy open a can they buy at the grocery store that says “Chili” on the side of it. 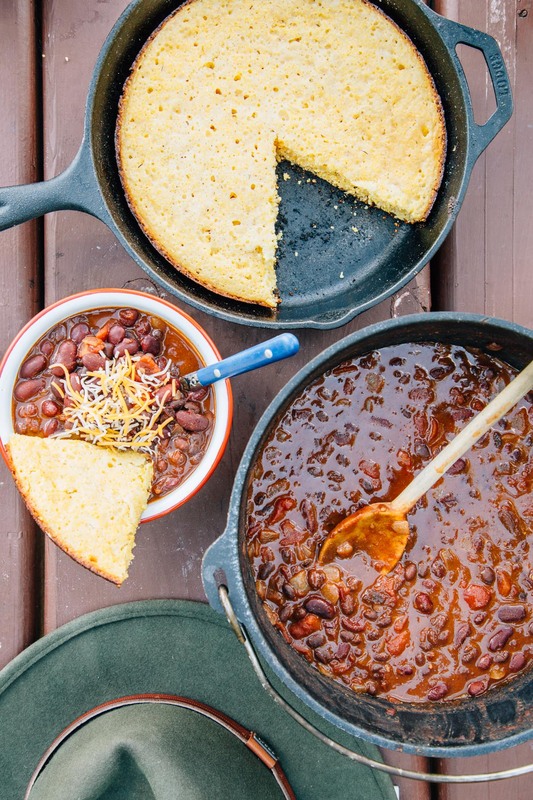 We hold nothing against either camp, but this recipe is for everyone in between. 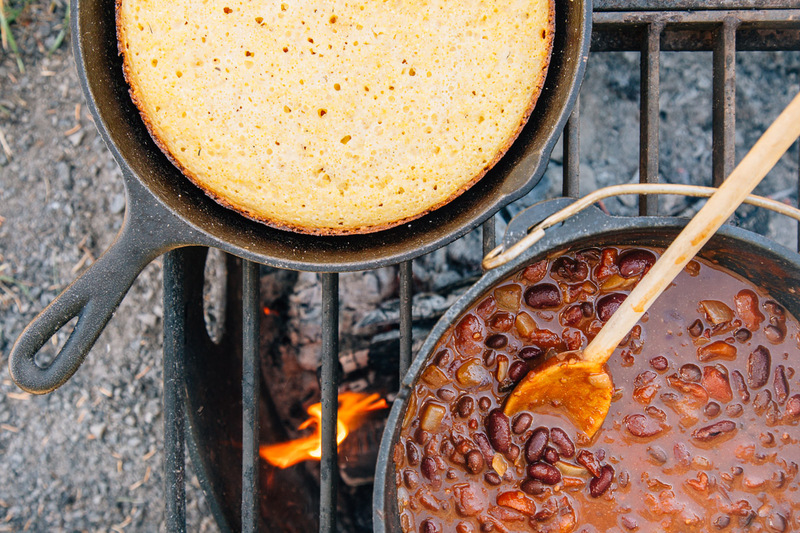 When camping, few people have time to properly cook dry beans – a process that can take the entire afternoon. And if refrigeration is doubtful, using fresh ground beef is out of the question too. Yet we’re not quite willing to surrender control of our chili to the lab coat wearing food scientists at Campbell’s Soups. 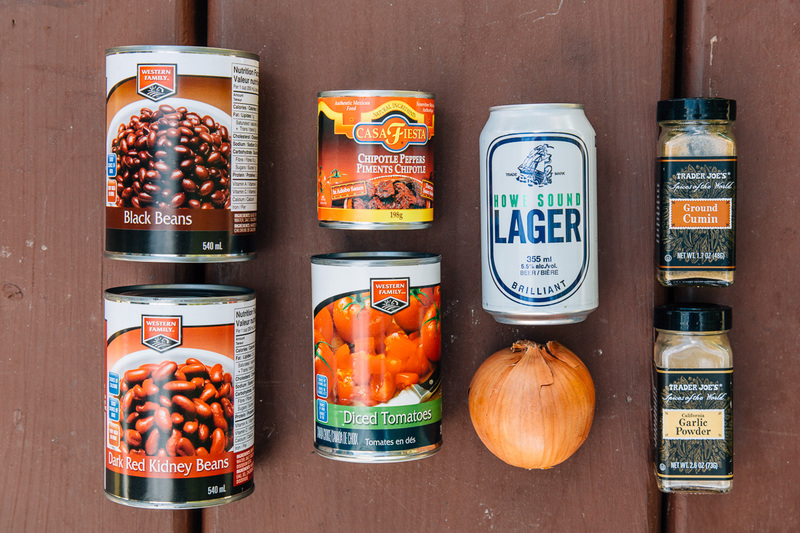 So, to find a middle ground, we’ve created this Five Can Chili using store bought cans: Kidney Beans, Black Beans, Diced Tomatoes, chipotle peppers in Adobo sauce, and a can a beer. Throw in a handful of common spices and you’ve got yourself a thick, hearty, smokey and spicy stew that will keep you warm throughout the evening. Variable Spice: This recipe has got some serious kick. We made this using the entire can of chipotles and the accompanying adobo sauce so that we didn’t have to store any leftovers – but in order to make the spice manageable, we sliced open the chipotles and discarded all the seeds and ribs. For a milder stew, scrape out the seeds and use only one or two chipotles. Or, to eliminate most of the heat but still get that great smokey flavor, just use the adobo sauce and reserve the chipotles for another use. Use your own judgment to determine how many chipotles you’d like to use. You can always add more if you find yourself craving more heat! Turns out we have a pretty high tolerance for heat in our chili! We've noted a few variations so that you can make this recipe to suit your spice preference. For a milder chili, just use the adobo sauce that chipotles come in. You can add additional peppers as desired - be sure to scrape out the ribs & seeds before adding them to the pot. Begin by prepping the chipotles. Most of the heat in the peppers are housed in the seeds and ribs, so we strongly recommend scraping out all of the seeds before adding the peppers to the chili, especially if using the entire can. Using a fork, remove the desired number of peppers from the can. Reserve the adobo sauce. Slice them open, and then using the back of your knife, scrape out and discard the seeds & ribs. Roughly chop the peppers and set them aside. 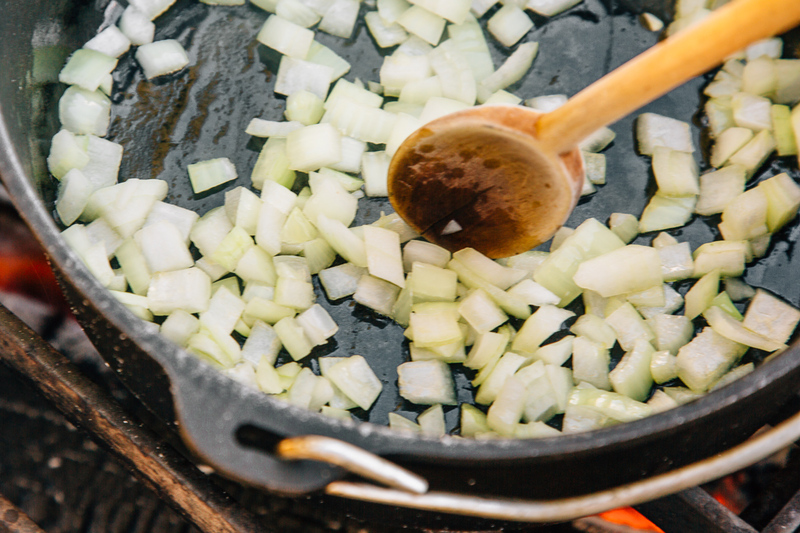 In a large dutch oven, heat the olive oil over medium heat until shimmering. Add the onions and saute until they begin to soften and turn translucent. Add the drained kidney and black beans, tomatoes and their juices, chopped chipotles and the adobo sauce, beer, salt and spices. Stir to combine. Cook the chili until thickened to your liking, about 20 minutes was perfect for us. 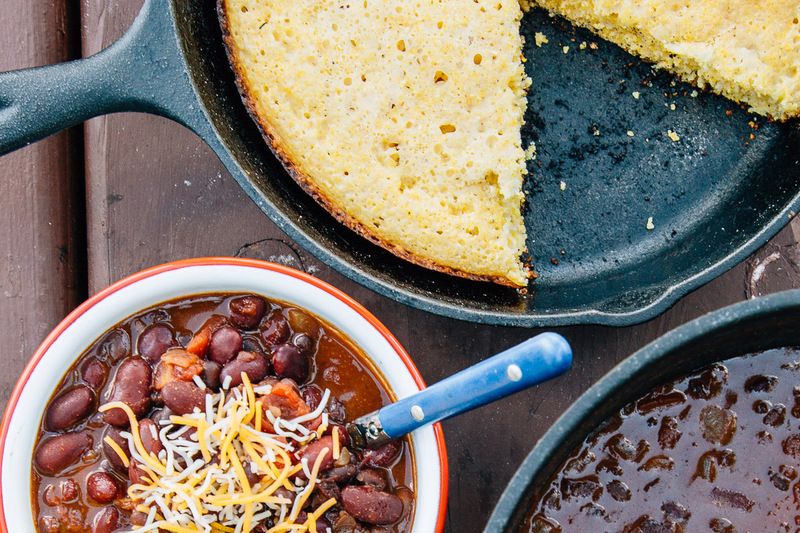 Serve immediately with your choice of toppings (cheese, avocado, green onions, etc) and cornbread on the side! We loved this. So easy and delicious. We made it a 6 can chili and added corn. Yummmmm! So glad you enjoyed this, Jess! And good call on adding the corn! My family isn’t a fan of beer. Plus we have a 3 year old. Does it taste like beer at all?? Or what could I sub instead? It doesn’t taste like beer at all after it’s cooked. But if you don’t have the beer on hand, then it’s not critical to go out an buy it. You could replace with beef/veggie broth. The condensed packets or bullion. I’ve made a version of this using rabbit and squirrel and store-bought ground turkey. Added some tomatillos all crushed up. My camping crew- all high school teachers, all thought it was chicken chili. All loved it. This looks so cool! ???? I’m almost ready to go camping, as long as I can get back into my own bed every night! That could happen, right? I’ll have to leave out the beer, for anonymous reasons, but maybe I’ll put in a can of seltzer or bottle of kombucha! We camp a lot and so we are always looking for good recipes. We made the 5 can chili last night, delicious! Thank you for this wonderful camping recipe. I cooked this and the cornbread and both were delicious. One change that I made was I used dried onions in place of an actual onion. I didn’t notice a difference and it made an already simple recipe, that much easier. just cooked it up at home for a trial run, sans beer and onion. Came out spicy (probably too many peppers), but good! Trying this tonight! Looks delicious! We’re test driving our Element camping set up this weekend for a longer 3 week journey to Banff this summer. I bet the Element is a perfect car for a longer trip. There is so much room in the back! Enjoy Banff – you’ll get to explore so much with three weeks! We went for a few days (two or three?) last summer and I know there was so much we missed. One thing off the top of my head that I would have loved to check out was the Lake Agnes Tea House & the Plain of Six Glaciers Tea House above Lake Louise.